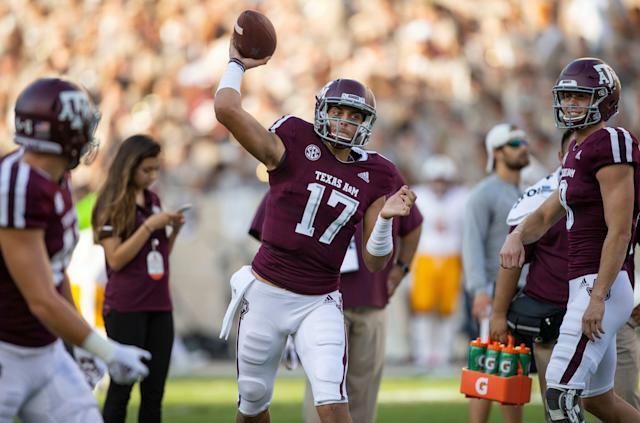 Former Texas A&M quarterback Nick Starkel is staying in the SEC. He’s heading to Arkansas. Starkel announced his transfer decision Monday night. Starkel is a graduate transfer and has two years of eligibility remaining and sets up a graduate quarterback battle for the starting job for the Razorbacks. Former SMU QB Ben Hicks previously announced that he was heading to Arkansas. Hicks, SMU’s all-time leading passer who played for Morris with the Mustangs, has one year of eligibility remaining. Starkel chose Arkansas over Florida State. The Seminoles have been in the market for a transfer quarterback after Deondre Francois was dismissed from the team. James Blackman is currently the top quarterback in Tallahassee. Starkel opened 2017 season as Texas A&M’s starter before he suffered a leg injury in the team’s Week 1 loss to UCLA. The Bruins’ comeback came after Starkel left the game because of injury. He returned midway through the season but lost the quarterback competition ahead of the 2018 season to Kellen Mond, the man who replaced him in 2017. Mond threw 415 passes in 2018 while Starkel threw 22 in Jimbo Fisher’s first year in College Station. Starkel ended up playing in 11 games over two seasons. He was 138-of-227 passing for 1,962 yards and threw 15 touchdowns and six interceptions.